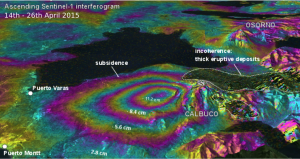 After 43 years of quiescence, Calbuco, Chile, began erupting on 22 April 2015, prompting the evacuation of thousands of residents. SAR data from the pilot project were used to characterize co-eruption surface deformation, which helps to constrain the location of the magma body that fed the eruption. Coeruptive ascending Sentinel-1 interferograms show deflation with a maximum line of sight change of 12 cm located on the west flank of the volcano. Other interferograms constrain the deformation to have started no later than 1.5 days before the eruption, and to have lasted no more than 1 day. A model of the deflation indicates that the source is located about 5 km SW of the volcano’s summit at a depth of 9.3 km beneath the surface, with a volume changes of ~0.045 km3. This source geometry and strength is consistent with recordings from a tiltmeter located 4 km W of the volcano. Observed (left), modeled (center), and residual (right) deformation at Calbuco from a Sentinel-1a interferogram spanning April 14–26, 2015. Deformation can be approximated by a source at ~9 km depth beneath the volcano’s west flank. Courtesy of ESA. The large amount of ash released by the eruption (more than 0.1 km3) had a significant impact on air traffic in Chile and Argentina. This ash was tracked using a variety of thermal and visual remote sensing data and was communicated to the Volcano Ash Advisory Center in Buenos Aires.